Unroll the pastry sheet and separate it from its parchment paper backing. Place the parchment on a baking sheet, sprinkle the paper with 11/2 tbsp brown sugar; put the pastry on top of the sugar. Prick the pastry with a fork and scatter over the semolina. Preheat the oven to 220C/gas 7. Peel the apples, core and slice them thinly. Lay them over the pastry, overlapping the slices slightly. Brush with the melted butter and sprinkle with the remaining brown sugar. Bake for 10 minutes, then lower the temperature to 180C/gas 4 and bake for a further 25–30 minutes until the apples are beginning to caramelise. 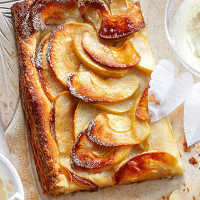 Place the tart with its paper onto a cold surface and carefully slide it from its paper onto a board. Dust lightly with the icing sugar before serving. chardonnay and very elegant, like this one.